NEW! Accredited Award in Fire safety Evacuation specifically for Care Homes! Why do I need this training course? Fire training may well be the most important training you will need to consider. How your staff handle a possible fire evacuation may affect the future of your business and the lives of your residents or staff. This award provides both your fire Marshall and your staff an opportunity to reach a level of competence which is auditable and proven. This gives your staff the confidence they need to carry out a fire evacuation safely and without panic, safeguarding your residents, your staff and your business! How is it possible being that fire evacuation is practical? This ODLQC accredited distance learning course has been made possible by using animated ‘virtual’ evacuations which learners watch on a computer, projector or TV. The format is of your choosing, although most clients choose either windows movies or apple quick time files which is supported on any computer with Windows 7 or above. It is important for you to have evidence that staff have understood the process, so the course includes questions, there are eighty in total, which employ a multiple choice based approach to answers which your on site fire Marshall can supervise. 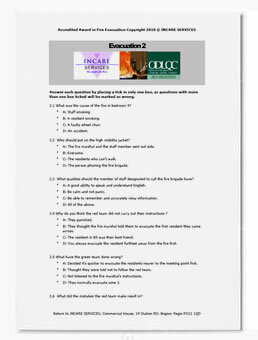 Learners watch the scenarios, answer the multiple choice questions, they can then be audited at any time. That’s it! A permanent and powerful resource that’s quite simply excellent value! What if my staff do not have English as their first language? For a limited period only and as an introductory offer to our services we are offering you the chance to buy an unlimited licence ownership for just £145 (NO VAT) ! N.B Data is supplied electronically. That’s incredible value for a training resource that you will be able to use again and again!! To enroll simply download the Enrolement Form complete the details and return by post with your remittance.